Outdoor warning sirens are used to alert residents who may be outdoors when a Tornado Warning is issued by the National Weather Service, a funnel cloud is reported by credible source, or a chemical emergency has occurred and a shelter-in-place order has been issued. The sirens are not intended to alert people indoors. It is highly recommended that each residence, business, school and church have a NOAA All-Hazard Radio that will automatically activate during severe weather and hazardous materials events. Text and e-mail alerts are also available via the National Weather Service and other major media outlets. A Chemical emergency has occurred resulting in a shelter-in-place order to be issued. The outdoor warning sirens are tested the first Wednesday of every month at 12:00 pm. If severe weather is forecast, or is observed in the area, the monthly test will be postponed until the next monthly test to avoid confusion. 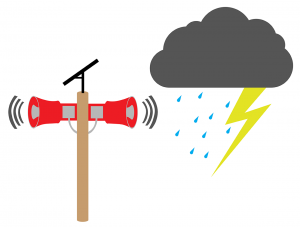 The monthly tests are conducted to test the operation of the sirens and to familiarize the residents with the sound of the siren, should a Tornado Warning be issued. The outdoor warning sirens in Clermont County are owned, maintained, and repaired by the local Cities, Townships, and Villages. Questions and concerns about siren operability and/or inoperability should be directed to the local fire department where the siren is located.